It is unusual to see a highlight reel of a peewee football player whose stats are so impressive – 35 touchdowns, 65 tackles and nearly 2,000 rushing yards. Such numbers would make an NFL scout do a double-take. 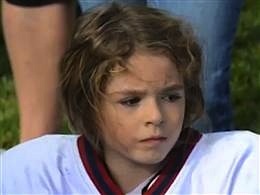 What’s even more unusual is that this particular football player is a 9-year-old girl from Salt Lake City named “Sam” Gordon. She outruns boys two years her senior and will drag them behind her if they try a tackle. Thanks to Rebecca Dornin for sending the link!